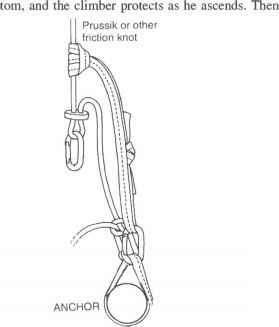 The basic method of climbing vertical ice is front-pointing combined with use of two ice tools in piolet traction, in which you pull down on both tools as you ascend (fig. 14-28). 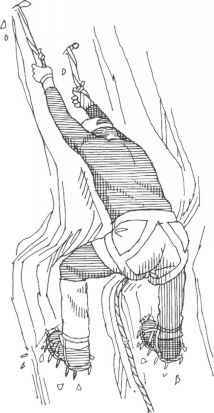 The standard position for the feet is about shoulder width apart and level with each other, a stable and relatively comfortable stance. Reach up and plant the pick of one ice tool as high as possible—but off to the side a bit so you're not hit by dislodged ice or by a tool that comes loose. Then plant the other tool, in the same manner. crampon points. You can liken this to a mild lie-back on rock. To conserve energy, you can now hang your weight from the wrist loops rather than gripping the tools tightly. To ascend, grasp the tools and pull yourself higher as you step upward on the front points to a new level position. You're now ready to replant the ice tools higher, one at a time, returning you to the X body position. Repeat this sequence. 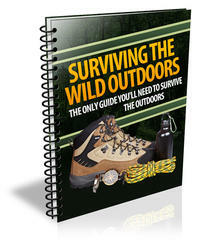 Concentrate on efficient, methodical placement of crampon points and hand tools. Rhythm is as important as balance. tool. You're now back in the X body position, ready to repeat the sequence.